In this second report in the MidtownKC Walks series, residents say they are surprised to learn that responsibility for sidewalk maintenance lies with individual property owners. In the first story, Kansas City residents, especially those in Midtown, said they are more dissatisfied with the condition of sidewalks than almost any other city service. As the series continues this week, we’ll learn why demand for well-maintained sidewalks is increasing, what other cities are doing, and what could be in Kansas City’s future. MidtownKC Walks Project is a joint project of the Midtown KC Post, BikeWalkKC and The Whole Person. Join a conversation about sidewalks on the Midtown KC Walks page or comment on these stories. We also have a survey about your experiences walking in Midtown and a map where you can mark sidewalk problems you encounter. Join the MidtownKC Walks mailing list for updates on the project. Residents of Midtown are among the most dissatisfied in the city when it comes to the condition of sidewalks. They are also often surprised to learn that it is the adjacent property owner who is responsible for repair of the sidewalk, even when problems with it are caused by trees along the city street. With dissatisfaction about sidewalks running high, many people are surprised to learn about their own responsibility for repair. Sean Demory, spokesman for the City’s Public Works Department, says the city’s code of general ordinances makes the responsibility clear. That’s the way it has been for as long as anyone remembers. “The idea is that you will utilize someone else’s sidewalk and they will utilize yours,” says Mayor Pro Tem Scott Wagner, a second-term councilman who has spent a lot of time researching sidewalk concerns and policy. But the city doesn’t have sidewalk police, like it has at some times in the past, who go out looking for problems. Sidewalk repairs are triggered solely by complaints that come in through the 311 system or other means. “When we get a complaint, we send an inspector out to review the sidewalk. If it is out of repair, we put it on our list and notify the property owner,” Demory says. 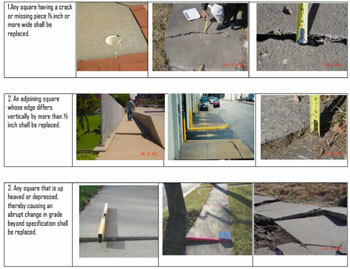 Examples from the city’s Out of Repair compliance guide. Any square having a crack or missing a piece ½ inch or more wide shall be replaced. An adjoining square whose edge differs vertically by more than ½ inch shall be replaced. Any square that is up heaved or depressed thereby causing an abrupt change in grade beyond specifications shall be replaced. Any loose material used as a sidewalk shall be replaced. Any curb abutting sidewalk is considered subject to the same criteria as for sidewalk condemnation. Any material used as a sidewalk that fails to meet City standards shall be replaced. Sidewalk that is 25 feet or less in length between two squares of sidewalk meeting criteria 1 through 6 above may be replaced when necessary to provide proper drainage or to provide proper vertical drainage. Overgrowth shall be removed that encompasses multiple sections to a complete cross section. That city estimates 50-60 sidewalk complaints come in each month through the 311 system. If they are investigated and deemed to be problems, the city notifies the property owner of what needs to be repaired or replaced. Then the owner has a choice: make the repairs or let the city do it. Both options have pros and cons. If the homeowner does the repairs, the work may be done faster and the cost may be cheaper. But the cost of repairing a sidewalk can be thousands of dollars, and for many homeowners, coming up with that kind of money can be an issue. They have the option of letting the city do the repairs. Fees are generally higher, in part because the city adds a 16 percent special assessment for administration and inspection, but the city now allows the property owner to pay off the repair over 15 years. That longer payoff period has helped a number of homeowners hit with bills for sidewalk repairs, but it also has an impact on another problem with the city’s sidewalk efforts – the long wait time between complaints and repairs, averaging almost three years between the time a complaint is made and the repairs are completed. “We can’t get sidewalks built or repaired quickly enough,” Mayor Pro Tempe Wagner says. The problem is, as he explains it, the city has a limited amount of money to get the work done. The city sets aside $3 million for sidewalk repairs in the annual budget. The faster people pay back the city for the repair to their sidewalks, the sooner than money is available again. But stretching out the payback time to 15 years has put further limits on what the city can accomplish, Wagner says. Another method of making sidewalk repairs is through the PIAC process. The city’s Public Improvements Advisory Committee hears requests from individuals and neighborhoods for capital improvement projects each year. The city council then decides which requests will be funded. 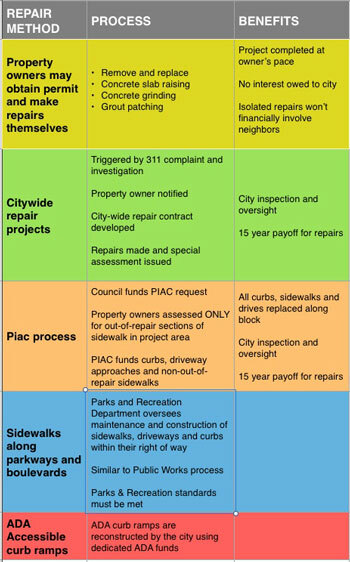 If a PIAC sidewalk project is chosen, PIAC funds pay for curbs, driveway approaches and replacing good sections of the sidewalk. Property owners pay only for the out-of-repair sections adjacent to their property. A few years ago, controversy erupted in the Manheim Park neighborhood when the city began removing trees to make way for new sidewalks in the Green Impact Zone. While some neighbors objected to the removal, others said getting sidewalks fixed was a top priority. The issues seemed to pit sidewalks against trees, a situation city Forester Kevin LaPointe faces on an almost daily basis. 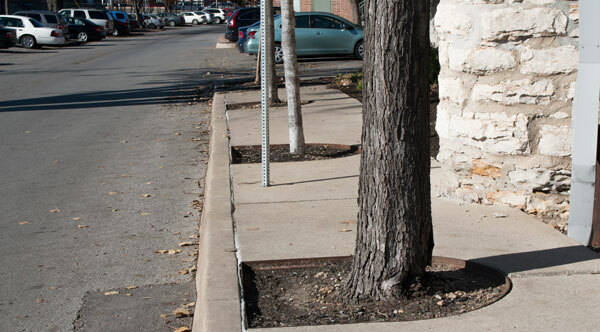 The main problem, he says, is large trees that were planted in between curbs and sidewalks and are now wrecking havoc on the aging sidewalks next to them. “There is no doubt that thousands of large shade trees were planted in areas not large enough for them,” LaPointe says. Many of the trees were either planted by the city or developers as areas of Midtown were being developed. They may not have forseen the impact. Not only did the mature tree grow too big for their adjoining sidewalks, people in Kansas City learned to love their tree-lined streets and boulevards. Now property owners are faced with trees roots pushing up through sidewalks, especially in older Midtown neighborhoods, requiring them to make repairs. LaPointe says he does all he can to avoid having to take out any tree because of sidewalk damage, but saving them can be tricky. Sometimes the roots can be cut or the sidewalk can bump around the tree. The city sometimes asks property owners for additional right-of-way so the sidewalk can be moved over, but on steeply-sloped lots that may be impossible. Moving sidewalks and changing the grade can also be more expensive. Problems with Midtown sidewalks and the city’s sidewalk policy have not changed much since this part of town developed, but the demand for more accessible sidewalks has been increasing steadily. Tomorrow, we’ll look at some of the reasons why as our MidtownKC Walks series continues. This all just doesn’t make sense. Years ago the city came through and planted trees along our sidewalks. Now these mature have done some major damage damage to the sidewalks and the homeowners are expected to bear the costs??? My father was smart enough back then to pull the tree they planted out, but not the next door neighbors. Now this tree has roots growing above ground and has majorally uprooted the concrete. Why should this be the homeowners liability? They didn’t plant the tree! It’s not only damages their sidewalk but affected our driveway as well! Just a few months ago the city came through and planted another tree on another neighbors curb to the left of my home. That homeowner was told if they removed the tree they would be fined. Fortunately storms toppled that sapling. If the city is going to plant trees in residential neighborhoods, fine homeowners if they remove them, the city then should be responsible for any damages the tree causes. Please explain to me to the logic behind what the city is doing.